What is the recommended cleaning procedure for Sepax's SEC columns? What may be the cause of peak tailing on SEC columns? How can I improve the resolution with my SRT or Zenix SEC columns? Are Sepax's SRT and Zenix SEC columns compatible with organic solvents? Can Sepax's SRT and Zenix SEC columns be used with surfactants? Should I use a guard column with the SEC analytical column? What is the difference between Zenix and Zenix-C or SRT and SRT-C? 1. Disconnect the column from the detector. 2. Clean your column in the reverse flow direction. 3. Run the column at less than 50% of the maximum recommended flow rate. Monitor the backpressure. If you see the pressure is much higher than the normal operating conditions, you need to lower the flow rate or change the washing buffer as the cleaning solutions may be of different viscosities. 4. Typically, 10-15 column volumes of cleaning solution are sufficient. Rinse well with 3-5 column volume of Nanopure water between each solution. Low pH salt solutions help remove basic proteins. Organics are useful when removing hydrophobic proteins. Chaotropic agents help remove strongly adsorbed materials (e.g., via hydrogen bonding). Only use chaotropic agents when neutral salts or organics have not improved resolution. 1. Wash with Nanopure water for 2 column volumes at the recommended flow rate. 2. Wash with 6M urea for 2 column volumes at half the recommended flow rate. 3. Wash with Nanopure water for 20 column volumes at half the recommended flow rate. 4. Wash with 150mM Sodium Phosphate Buffer for 7 column volumes at the recommended flow rate. Secondary electrostatic, hydrophilic or hydrophobic interactions between the mobile phase and the stationary phase are commonly the cause of peak tailing because they reduce the number of available adsorption sites. In order to avoid such secondary interactions from occurring, we recommend using a 150mM Sodium Phosphate Buffer, pH 7.0. 1. The advantages of using a smaller particle size are higher efficiency and higher resolution. When particle size is decreased to 3um (Zenix) from 5um (SRT), the column efficiency is almost doubled. 2. If you are overloading the column this will result in a loss of resolution. Try injecting a smaller amount of sample onto the column. 3. Running two columns in tandem results in an increase of column efficiency and in improved resolution. All of our SEC columns are stable in both organic solvents, such as methanol, ethanol, THF, DMF, DMSO, and so on; as well as a mixture of water and organic solvents. If you are using a surfactant in the mobile phase and/or in the sample formulation we recommend that the column only be used for that application. The best way to protect the analytical column is to install a guard column in front of it. In most cases a precolumn filter helps to remove residual particulates. However, a guard column is highly recommended because it is more effective in trapping highly adsorptive sample components and residual particulates in the sample, the mobile phase or from the HPLC system. 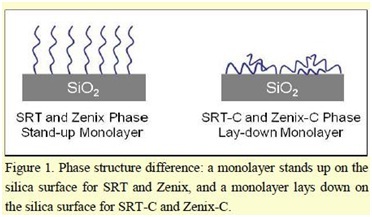 Zenix-C and SRT-C SEC phases use lay-down monolayers on porous silica as opposed to Zenix and SRT SEC's stand-up monolayers (as shown below). The SEC C-line offers ideal phase chemistry for hydrophobic samples like insulin, membrane protein monoclonal antibodies derivatized with polymer branches (polypeptide or PEG) separation.